This is the section for knives that will tackle any chore be it a cutting contest or a contest with the great outdoors. Big knives are fun! 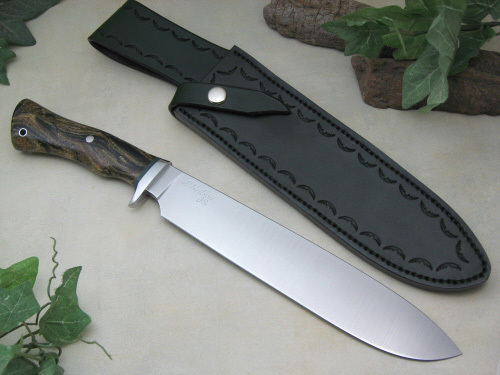 This big, full tang Chopper/Camp Knife has a 10 1/8" cutting edge and is forged from 5160 high carbon spring steel. The blade has a thumb rise on the spine for better control, a differential heat treat (hard edge and soft spine) and a satin finish. The handle scales are red dyed/stabilized Pine Cone with a beveled face and flared pommel/base. The handle scales are secured with stainless steel handle bolts and a matching lanyard liner. The overall length of this knife is just a bit over 15" and comes with a leather blade sheath with belt loop and retention strap. This "camp cutter" is a full tang knife forged from Cru-Forge V high carbon steel. The blade has my forge-marked/acid-soaked flats and "antiqued" finish along with some "jimping" as a thumb rest on the spine for better control. The tang has a very slight taper and is "honeycombed" to reduce weight. The handle scales are sealed, A-grade Teak done in a "palm swell" style and are secured with stainless steel handle bolts that have been textured, along with a matching lanyard liner. 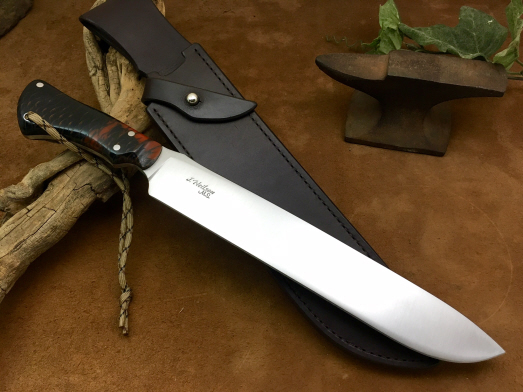 This knife has a 8 5/8" cutting edge and an overall length of 13 1/2" and comes with a border tooled leather pouch sheath with a belt loop. My Field-Bush knives are thinner/lighter than the other "Choppers" on this page but, just a tough and ready to clear a path. 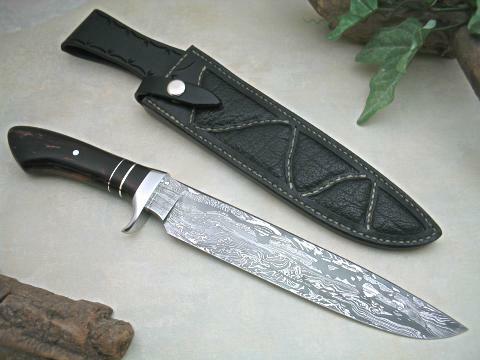 This piece has an 11" blade forged from 52100 high carbon steel that has a hand-rubbed finish and is etched to show multiple hamon/quench lines. The hardware on this piece includes a fullered wrought iron oval guard and a matching, threaded pommel that has been filed to fit-up to the handle contours. The handle itself is Elk antler with black spacers on each end. The overall length on this piece is 16 1/2" and it comes with a border tooled leather blade sheath with "high ride" belt loop and retention strap. 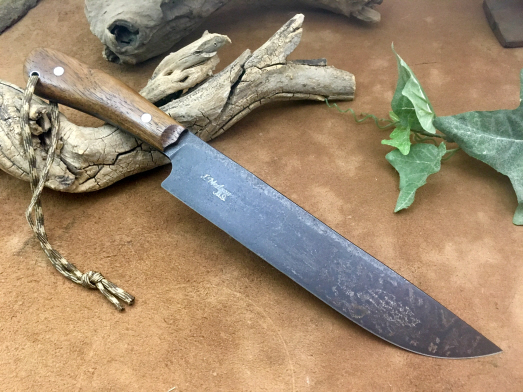 This big, full-tang chopper has a 10 1/4" edge-quenched blade of 5160 high carbon steel with acid soaked/forge finish flats, antiqued/ boiled mustard bevels and a filed thumb rest. The "palm swell" handle is African Blackwood with stainless steel handle bolts and lanyard liner with a polished tang. This knife is 15" overall length and comes with a tooled leather "sash" sheath. 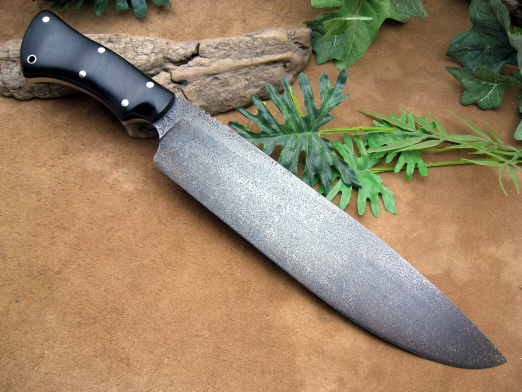 This full-tang Camp knife has a recurve ground, random damascus blade 10" long. The guard is etched 1018 carbon steel. The fully etched tang is sandwiched in by Olive- green canvas Micarta with multiple stainless steel handle bolts and a matching lanyard liner. 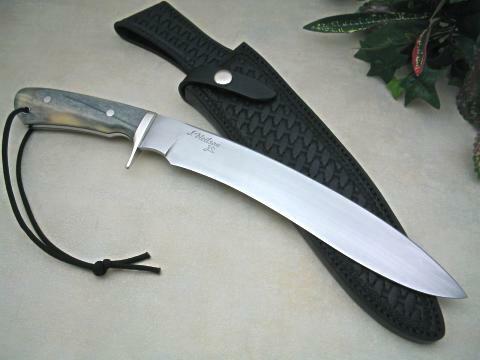 The knife is just over 15" overall and comes with a sturdy leather blade sheath with belt loop and tie tab. This chopper is similar to my Basic Utility Bug-out Knife, just a bit more dressed and a bit bigger. The 10 3/8" blade on this knife is forged from 5160 high carbon steel with a brushed satin finish. The guard, handle pin and lanyard liner are stainless steel. The handle is Jade-green G-10 with belly texturing and a green spacer between the guard and handle. The knife is 15 3/4" overall and comes with a border tooled leather blade sheath with a belt loop and strap. This big chopper is an off-shoot of our original "Ham-Hands" model... and then some. This knife has a 9 3/4" edge-quenched blade of 336 layer damascus forged from 5160 & 15N20 high carbon steels in a "random cut" pattern. The guard and threaded pommel are 4140 steel with and antiqued/mustard finish. The handle is a large piece of Sambar Stag with black spacers on each end. 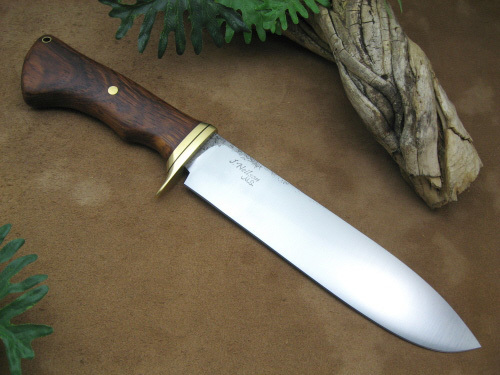 The knife has an overall length of 14 1/2" and comes with a tooled leather post sheath. 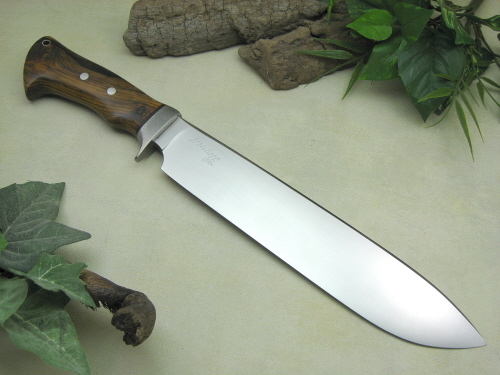 This camp chopper has a 9 3/4" blade forged from JD5160, flat ground with a convex edge and a satin finish. 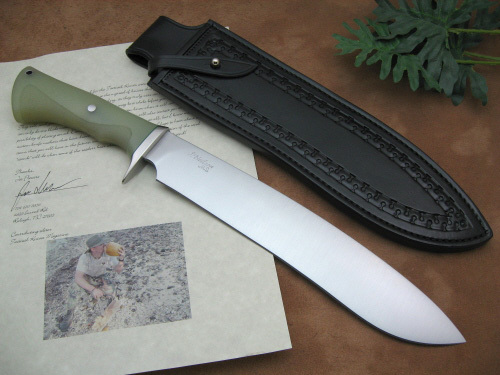 The overall length of this knife is just over 15". The guard on this piece is carbon steel. The handle is Burlap mycarta (mycarta made by L.R. "Butch" Harner) with a green Micarta spacer and a stainless steel pin and lanyard liner. The knife comes with a border tooled leather blade sheath with snap and loop. This no-nonsense chopper is forged from 5160 steel. 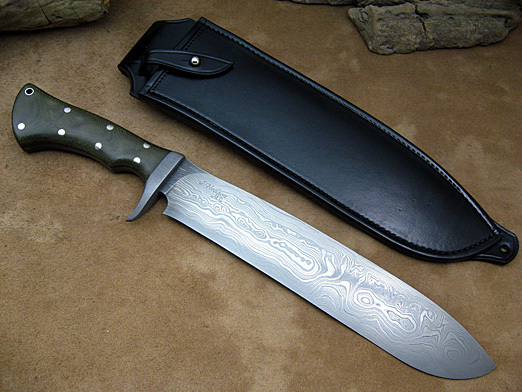 The blade is 10" with an etched/satin finish, forge marked flats and a rounded spine. The double brass guard has a black spacer on top of a Cocobola handle with a brass pin and lanyard liner. This knife is 15 1/2" overall and comes with a border tooled leather blade sheath with a snap and loop. 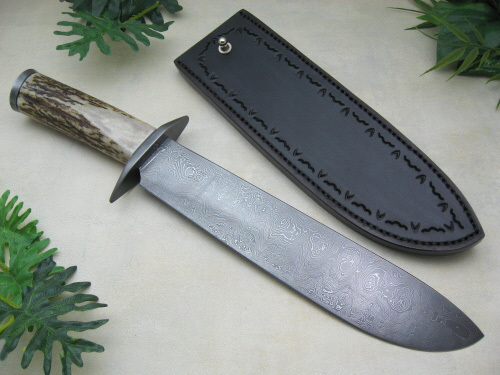 This big chopper has a 10" blade of satin finished 5160 spring steel with a beveled spine and is about 1 3/4" at it's widest point (from spine to edge). The contoured guard is stippled and cold blued 1018 carbon steel. The handle is Cocobola wood with a maroon Micarta spacer and stainless steel pins and lanyard liner. 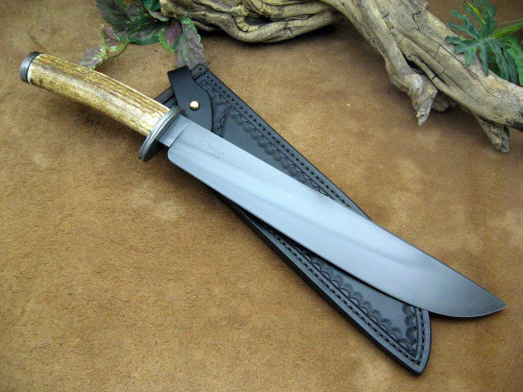 This piece is 16" overall and comes with a tooled leather blade sheath. This camp knife has a 9 1/8" blade of high carbon "frontier" damascus steel that's just over a 1/4" at it's thickest with a low top bevel on the spine to compliment the flat grind and full distal taper. Overall length is 14 1/2". The handle is stabilized Flame Ebony wood with a carbon steel guard, stainless steel pin and staggered nickle-silver spacers. The knife comes with a tooled leather blade sheath with Cape Buffalo inlays and tan stitching, matching the tan streaks in the handle. Here's another "Big Claw". 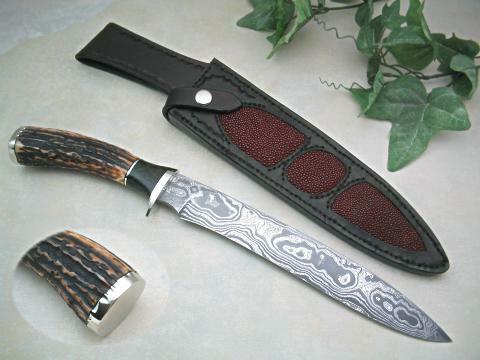 This recurve hunter/camp knife has a 10" blade of 400 layer damascus. The blade has a slight convex grind and a shallow top bevel on the spine. The handle is Sambar stag with a throat of stabilized/green dyed Redwood Burl wood and black/ nickle-silver spacers. The contoured guard and pommel are also nickle-silver. The tooled leather blade/belt sheath has three windows inlaid with brown Stingray skin. Here is our "Big" Hunting Claw in a full tang version. The 9 3/4" blade of 5160 has a tapered tang and a hand-rubbed finish (14 1/2" overall length). The blade has a slight convex grind and a bevel on the spine. The guard is nickle-silver. The handle scales are stabilized Giraffe bone with black liners, stainless steel handle bolts & lanyard liner. The knife comes with a full "basket-weave" blade sheath.